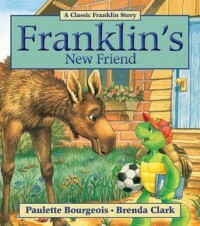 Franklin's New Friend by Paulette Bourgeois is one of my childhood favorites. It is a wonderful story about friendship and making new friends. It teaches a valuable lesson on not "judging a book by its cover" and instead getting to know someone for who they are. I believe this would be a great read for children of all ages. The storyline is easy to follow and the vocabulary is great for all ages. I would use this lesson to emphasize the importance of accepting those who are different from us instead of discriminating against them. I would encourage people to embrace their differences and the difference of others. This is a great character building book. I would also use this book to inspire students writing. I would ask them to write a story about a time they misjudged something or someone and turned out to enjoy it or like it/them in the end.